Hrmm…what else can I bore you with? Some of my inspirations, I guess…. Well, besides the Dangerous Beauty movie (which was the greatest impetus for this project), my second most important influence has been reading through the creation of the Seresina gown by Jwlhyferdewinter . It was the first venetian courtesan link I found, and had a great effect on what I saw in my future. Mainly my future being “yes, I could try this….” ANd her dress is so lovely, it is definitely inspiration to try my own! I wanted to show some portraits of elements I’d like to include in my ensemble. This also serves as notes for me to remind myself of things later! So bear with me…. Note: Besides the excellent silohuette, I chose this because I interpret the dress to be made from reddish velvet. Sound familiar? However, remember that I do not want the front ladder lacing in my dress, just this general shape. I may shorten the waist, as I am shortwaisted, and I want it to be comfortable and flattering to my figure. Afterall, what girl doesn’t? 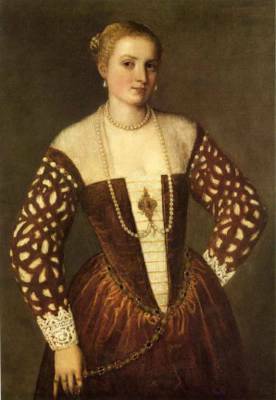 Below, we have proof that the Venetians did, indeed, have non-front-closure dresses and also featured split skirts with fun underskirts. This is part of my design concept as well. 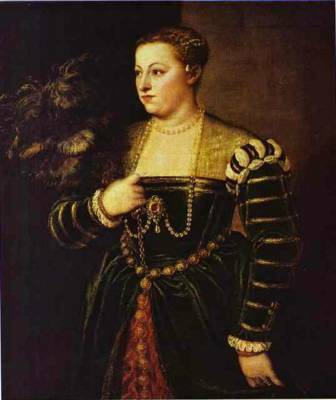 Again, a portrait of a velvet dress. Excellent. 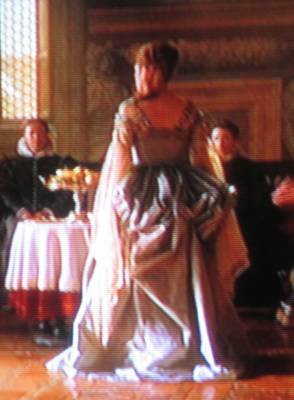 I am also interested in the method of trim on this dress, particularly the sleeves. I could entertain the idea of something like this…. I would love to have my gown puddling on the floor. Or have a nice little train. I do not know how reasonable this is, as I plan to be walking around the Faire in it. Many of the historical portraits and sketches do show the dresses to be longer than floor length, or featuring a train. One thought I'm toying with is that I could do JUST the train, but have the dress be to the floor (and no longer) in front. Then, for walking around the Faire, I could bustle it in the back. I have not found historical reference that this was done, but it does seem very practical, and I could imagine them doing it back then. I’m also inspired to do this by (you guessed it!) Dangerous Beauty! She has several dresses that she bustles (more excessively than I would, but you get an idea). I apologize for the crappy picture, but I took it of my TV, and those never turn out well. 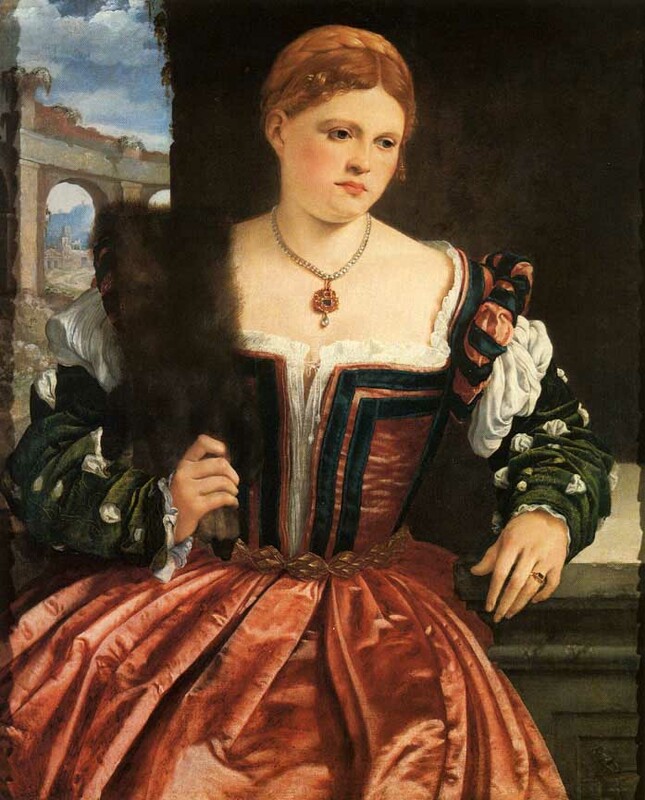 Additionally, referring back to the Vecellio Sketch above, I want the back of my dress to have the “V” back at the waist and the low square neckline in the back, as seen on so many gowns of the time.